Below are some pictures showing a simple press that can be used to make radiant floor heat spreader plates. 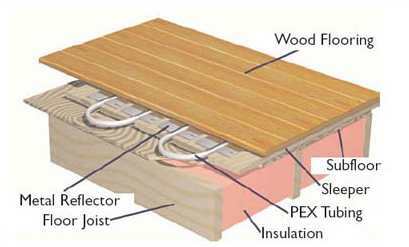 These thin aluminum plates (shown in the diagram below) spread the heat from the PEX tubing to the surrounding floor more efficiently than just allowing the heat to be conducted through the wood. They also result in less of a hot spot right over the PEX tube. This kind of press might also be used to make the fins to conduct heat into the risers on a solar collector. The heat spreader plates are called "Metal Reflector" in this diagram (even though they transfer heat by conduction and don't reflect anything). You can buy these plates preformed from various places, but, being cheap, I decided to make my own. I used sheets of aluminum soffit material that my lumber yard sells for covering roof soffits -- this was the cheapest source of suitable aluminum I could find. The process starts by cutting the soffit panels down to the width you want for the spreader plates, and these into 2 ft long sections (the max width the press will handle). This cutting can be done several sheets a a time with a Skil saw or table saw using an ordinary wood cutting blade. WEAR SAFETY GLASSES!! -- LOTS OF METAL BITS WILL BE FLYING AROUND. The aluminum sheet metal (0.019 thick) is pushed down into the channel formed by two pieces of 3/4 inch plywood screwed to the top of the bench. Wedges are placed under the plywood pieces to give the formed plates a slight down slope from groove to the outer edge. The groove is formed when the 5/8 inch diameter steel bar (with the red end) is pressed down into the plywood channel. The press pivots about the half inch steel bar that is below the 5/8 inch bar. The metal spacer between the 5/8 inch bar and the plywood was added to make the groove slightly deeper. Shows the press in use. Force is applied to the long handles in the foreground to press the 5/8 inch steel bar into the plywood channel, and form the groove in the aluminum sheet. Applying force to the press. The handle length is such that about 7 times the force applied to the end of the handles is applied to the 5/8 inch steel bar. Or, about 1300 lbs if you apply full body weight to the handles. Note that the properties of aluminum and its alloys vary a lot, and you may well have to do some fussing around with the channel and bar arrangement to get the groove shape you want. The softer the aluminum the better. The press will not work at all for some aluminum alloys or tempers. Best to buy a small quantity of the aluminum you plan to use, and see if its possible to get the results you want.